I bought a flashlight from an ebay seller, the description was labeled with Cree XML T6. But is is definitely some XPE ? I saw the model with a lot of brands … it is hard to figure out who has the best price and quality. Are there there are recommendations? The general recommendation is to not buy that flashlight. Wowtac and Brinyte make some decent quality zoomies. You seem to be correct. Looks like an XPG type and not XMLT6. These types of torches sell like hotcakes. It’s a crap shoot as to what you get sometimes. That said, what you have should have way MORE throw and less FLOOD being xpg type. If you run it with lithium 3.7 volt battery should be putting out lots of bright throwy light. ETA: You didn’t say if it also accepted 18650 lithium battery, as most of these types do. If it does accept 18650, it will be MUCH MU“C“H”“” brighter than simply 3xAAA’s. I’ve seen these going for less than 4 bucks and as much as 8. Like previously stated, these are marketed by the millions and what you get is anybodys guess sometimes. For a budget light if you really desire an XMLtype, check out the Convoy branded C8- XML2 or even Convoy S2- XML2 types. XML2’s are Floody lights for sure. Yes, the light color seems to be very white, bluish. How can you identify that the emitter is fake? I can only suppose it is probably not even a real cree XPE. I also noticed, the reflector is only brown cheap plastic. Yes, is can be used with 3xAAA or 18650, but I would have to buy an extra charger and batteries for this light. 3xAAA is 3×1.2V (rechargeable), the 18650 3.7V … can it make so much difference? YES !! Greater AMP DRAW ! ^^^^^^ But instead of wasting money on battery and charger….you should check out the Sofirn SP32A V2 deal which includes the light you would love plus a battery and charger. The "reflector" is not a reflector ! What you call a reflector is in fact the exact oposite it is here to prevent any light not coming directly from the emitter from spoiling the tight beam. Of course there is some light lost in the process (so that kind of torch is not efficient lumen wise) but this is the price to pay for a tight throwing beams. Here are some good flashlights at a great prices. Sorry for your loss. VIPON is easy to use. Several people here have gotten good deals here. Can this little Sofirn SP32A V2 in combination with a Cree XPL2 LED and 18650 rechargeable battery produce 1300lm output for real? 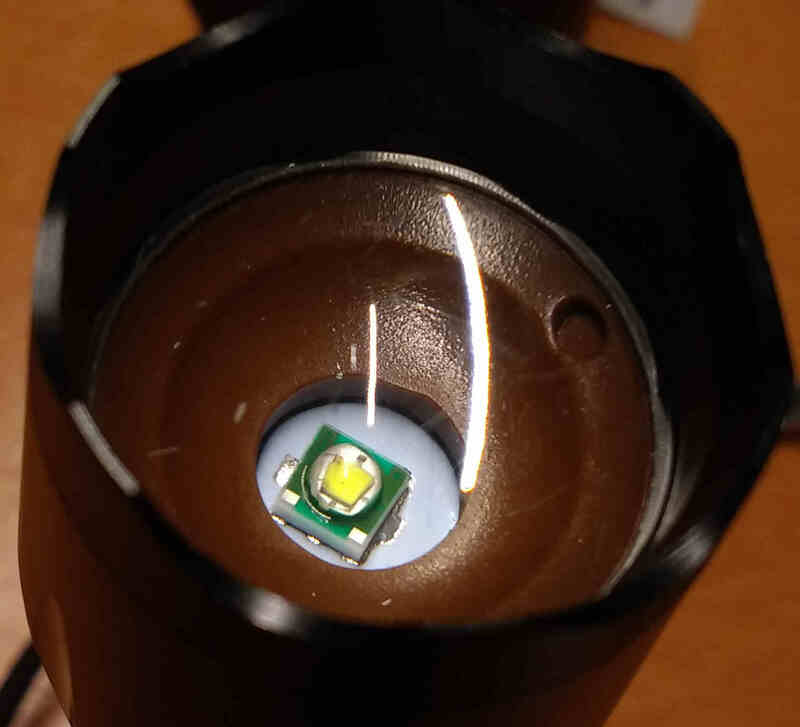 Or is this the max output of the LED in theory? I know that on ebay, the sellers seems to be very creative by adding zeros. I’ve seen 10,000 lumens advertised in what you recently bought. Come on…total BS…but sells lots of lights right??? How can you identify that the emitter is fake? Piece of junk Atomic Beam, Tactlight clones. A clone of an already crappy light. Does that make it craptastic? I like clones, I really do. I just thought that you were suppose to choose a decent product to clone. I have some great clones of some great knives. They are sold as such but, clones none the less. Back when I was a newb, I got a similar one to this that advertised 87K lumens. I remember thinking back then “man, one lumen is almost nothing, eh?”.